The countdown is on for the 50th anniversary of the Apollo 11 moon landing, and that means the appointment books for space luminaries and their fans are filling up like the propellant tanks on a Saturn V rocket. 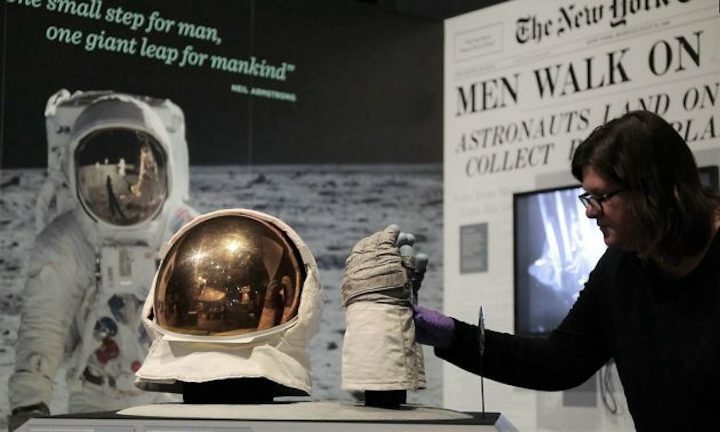 Seattle’s Museum of Flight is one of the epicenters for the festivities, thanks to its status as the next stopover for the Smithsonian Institution’s traveling “Destination Moon” exhibit. Due to a remodeling project at the National Air and Space Museum, some of the choicest Apollo artifacts are going on the road. The Museum of Flight will be hosting the exhibit starting next month and running all the way through the July 20 anniversary into the Labor Day weekend. Just this week, curators worked in a sealed-off section of the museum to get the helmet and the gloves worn by Apollo 11 astronaut Buzz Aldrin ready for the exhibit. A magnifying glass was positioned near the cuff of a glove to give museumgoers a close look at the checklist of tasks Aldrin was given for his moonwalk. The checklist reminded him about an important chore: taking a picture of a bootprint. “Destination Moon” officially opens on April 13, but VIPs will get sneak peeks starting a couple of weeks before that date. There’s a luncheon for museum members on March 30, featuring talks by Apollo flight directors Glynn Lunney, Gerry Griffin and Milt Windler. A members-only preview of the exhibit is planned for April 6. The exhibit’s centerpiece is Columbia, the Apollo 11 command module that orbited the moon and brought the astronauts back to Earth, but Seattle museumgoers will be getting a bonus. Separate from the Smithsonian’s artifacts, the Museum of Flight is displaying the remains of Saturn V rocket engines that were recovered from the Atlantic Ocean’s floor during an expedition backed by Amazon billionaire Jeff Bezos. Seattle may not have Aldrin in July, but the Space Frontier Foundation’s NewSpace conference is due to return to the Hyatt Regency Lake Washington in Renton, Wash., on July 17-19. NewSpace will focus on commercial space ventures that could facilitate trips to the moon and onward to Mars within the next decade or two. There’s so much going on in July that one 50th-anniversary space gathering had to be moved to September. The Space Studies Institute, founded by Princeton physicist Gerard O’Neill, is planning a conference on Sept. 9-10 at the Museum of Flight to mark the 50th anniversary of the Apollo moon landings as well as the 50th anniversary of O’Neill’s “High Frontier” space settlement concept. “SSI 50: The Space Settlement Enterprise” will take a fresh look at the High Frontier idea, and take stock of new technologies in fields ranging from habitat and facility design, to space transportation to life-support systems and space resources. Conference chairman Edward Wright said the conference will also take on the “800-pound gorilla” hanging over the concept: Is space settlement economically viable? Not having an answer to those questions is arguably the biggest reason why humans haven’t gone back to the moon for nearly 50 years. Over the past five decades, there have been all sorts of ideas about what financial opportunities await in space, ranging from asteroids rich in valuable metals, to space solar power stations, to helium-3 fusion fuel from the moon, to space hotels. Figuring out the killer app for space settlement would truly be one giant leap. But Wright is realistic about the challenge.